This site is still a work in progress - please be patient! 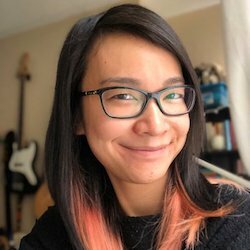 I'm Jenny Zhang, a full-stack web developer and freelance writer. I'm a big fan of semantic code, responsive design, and open source software. I'm also a fierce advocate for expanding access to technology and overcoming diversity gaps in STEM. When I'm not wrangling code, I'm reading and writing about a wide variety of social issues in the tech world, building towers and defending them, or working my way through a massive stack of SF/F novels. Writing is my first love, and everything else in my life, including my passion for programming, stems from my desire to communicate with people. You can find my writing at my blog, on Medium, or through my politics TinyLetter. On most places on the internet, you'll find me under some variant of the username "phirephoenix" or "phire". It's a handle I picked long before I was old enough to realize that names have staying power, and that maybe a future version of me that was older than eleven wouldn't want to be known as a mythical animal with an alliterative phoneme. I've been using the handle for so long now that I can't really imagine going by anything else, and as far as "usernames you picked as a pre-teen that now constitute your entire online identity" go, I could be doing a lot worse.